Mo and Dale, along with all of our other favorite characters from Three Times Lucky, Newbery Honor winner in 2014, are back with another mystery to solve. A decidedly ghostlike mystery. Miss Lana, along with Grandmother Miss Lacy Thornton, find themselves the new owners of an old inn and, as it turns out, a ghost that was in the fine print. Determined to get the inn back up and running in order to sell it to someone nice (gotta have nice neighbors, after all), Miss Lana and the gang sets to work—only to find out that ghost might not just be a footnote after all. Mo, along with a reluctant Dale, seize upon the opportunity to interview said ghost for their history assignment. But can they 1) get her to talk to them, 2) figure out what old Red Baker is doing and why he's sneaking around everywhere, and 3) possibly figure out what happened to their ghost all those years ago? Mo is no coward, and along with Dale and new friend Harm Crenshaw, set out to do it all. I really, really love this series. And I'm so glad it's a series. I was very impressed with Three Times Lucky, as some of you might remember, and this is a great continuation. Turnage still deals with the tough realities of life in a gentle subtle way, without sugarcoating anything. There is an illegal moonshine still, poverty, bullying, and hints of past abuse and neglect, yet it's all very age-appropriate and well done. And Turnage adds in a hefty dose of humor. Mo is never fazed and generally seems to be a fantastic human being, though she does of course make mistakes and poor judgment calls now and then. It is nearly impossible to ruffle the girl, even when arch-nemesis Anna Celeste (aka Attila) continually brings up Mo's unknown origins to be spiteful (Mo was adopted by Miss Lana and the Colonel when she was washed downstream during a storm). Dale's father is now in jail, and Mo is pretty vocal about her opinion of him. She can't understand the complicated feelings Dale and his mother Miss Rose have about him; because at the end of the day, he's still Dale's father, and as Dale says, "you only get one Daddy." It is very clear that the whole situation is very hard for Miss Rose, who is trying to get on with her life despite not having much experience in not being in an abusive relationship. The whole situation was portrayed very well, and I thought Mo's child's understanding of it added much. Lots of showing instead of telling. I did think it was slightly strange that this volume went into the paranormal realm, but I like a ghost story now and then. This one was good; just surprised it veered into this genre after the first book was strictly realistic fiction/mystery. As for the narration, Lauren Fortgang was great. I was sad that Michal Freidman passed away shortly after narrating the first, but Fortgang was a worthy choice. Her matter-of-fact tone brought out the humor of Mo's inner dialogue and conversations with others, not to mention the vocal differences between characters was very well done. Anyway, would I recommend this book? You bet I would. 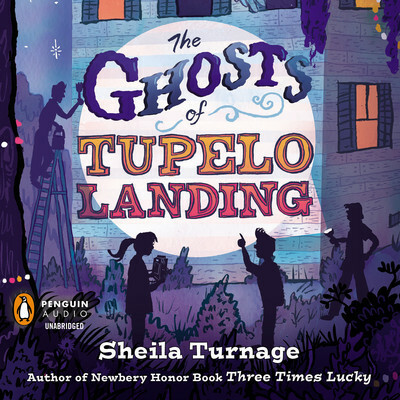 It's a great middle-grade mystery series with a quirky cast of characters in a small-town setting. Disclosure: I got a copy of this audiobook from OverDrive through my local library. Thanks for the review. I love ghost stories and MG so I'm def. going to pick this up.